From the sophistication of Paris apartments to the tranquility of country homes in Brittany and Provence, and the quaintness of the half-timbered buildings in Normandy, French house plans are marvelous sights. Think chateaus, rustic country farmhouses, and cottages – and you get the idea of the uniquely eclectic, romantic, and charming style of French home design. Each region in the country is known for its own distinctive character – and has inspired countless homes in the United States and Canada. 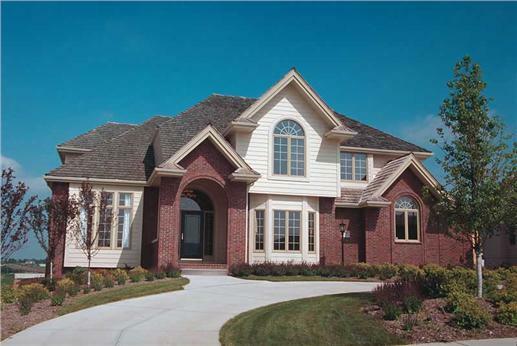 These two-story homes have attractive brick and stone exteriors and hipped roofs that add to their curb appeal. The four-bedroom (top) has a fireplace, patio and courtyard (Plan #188-1006). Inside the house at bottom (Plan # 178-1059) are high ceilings, master bedroom on the main floor, study, breakfast nook, and other amenities. Some of the more popular and romantic French home designs originated during the reign of Louis XIV - with the manor estates and chateaus built by the French nobles. Others, like the picturesque half-timbered houses in Normandy and Rouen date back to the Middle Ages when wood was used both for ornamentation and security. Check out the curved arches on the door and windows; and gabled roof of varying pitches of this two-story, five-bedroom house (top, Plan #161-1022). More curved arches and tall windows on this two-story four bedroom home (bottom) with the hip roof and brick/stucco exterior (Plan #120-1320). The French influence in North America dates back to the 17thcentury as French colonists grew the first major settlements of New France: Quebec City and Montreal. Settled initially by colonists largely from Normandy, the architectural style of these cities largely resembled Normandy style homes. By the early 18th century, the French had established permanent settlements – with French style architecture – in the U.S at New Orleans in the Louisiana Territory. So was born the French Colonial home with its pitched roofs, thin columns, porches, and living quarters built above ground (as a safeguard from flooding). Walk up to the covered entry and into the foyer of this French Colonial house (top) with four bedrooms, terrace, veranda, morning room and a great room. 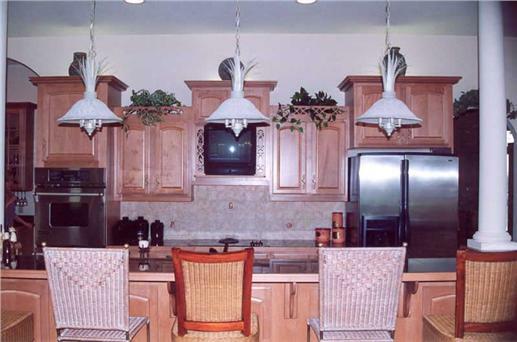 The kitchen (bottom) is adorned with and island, lights suspended from the ceiling, wood cabinets, and chairs (Plan #106-1174). But the French style really took off after the World War I when American and Canadian soldiers returned home. Vivid memories of the delightful French homes remained in their consciousness. 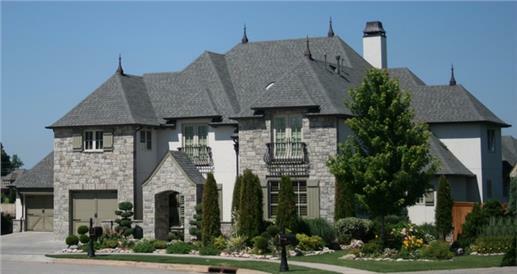 So they built homes reminiscent of the architectural designs they had seen in France. Between 1918 and 1940, the French Normandy style – which was patterned after homes in the Normandy region of France - was most popular. While having a long history in Canada, the home design also struck a chord with an emerging middle class in the U.S. willing to spend money on elaborate homes. In keeping with the picturesque manor homes and farmsteads on the Normandy countryside, these house designs included a round tower topped with a cone-shaped roof. Steep roof pitches, dormers and half-timbering recreated the romantic French chateau. 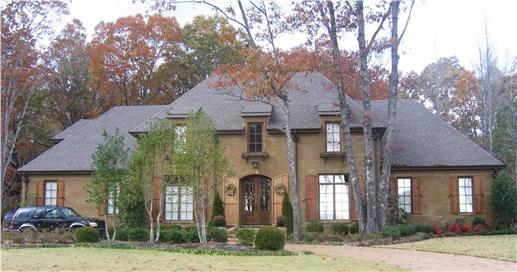 Brick, stone, and stucco exteriors are similar to other French style house plans. These majestic homes have impressive facades of brick and stucco. At top is a six-bedroom home (Plan #135-1216) with a playroom, den, breakfast nook, a computer loft; and a circular stone tower with a cone-shaped roof. The two-story, four-bedroom home (bottom, Plan #115-1174) has a covered porch, den, family room, and a Great Room that opens into the rear patio. (See photos below). 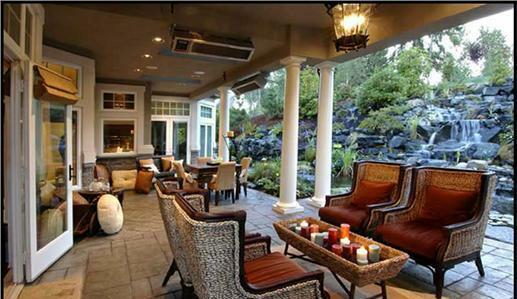 The stylish Great Room and rear patio decked with furniture in warm earth tones. 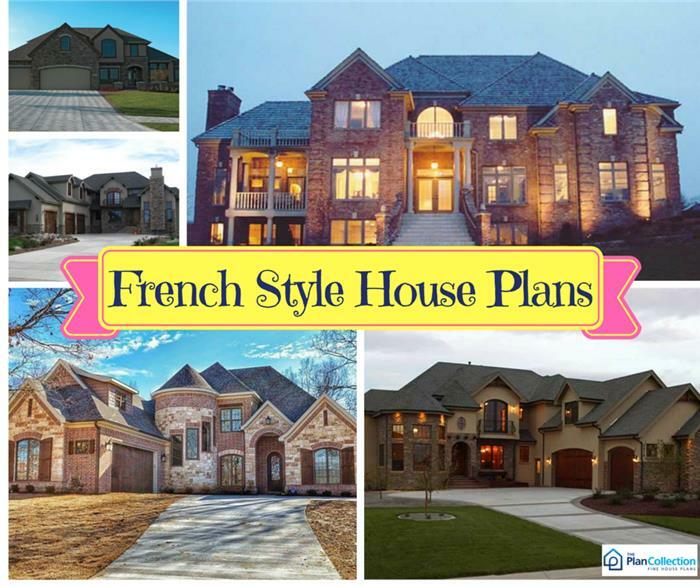 A variation of the French Normandy style, French eclectic house plans were fashionable in the 1920s and 1930s. Usually one to two-story structures, they are simple, square, and symmetrical with a huge hipped roof. Entrances are enclosed or recessed. 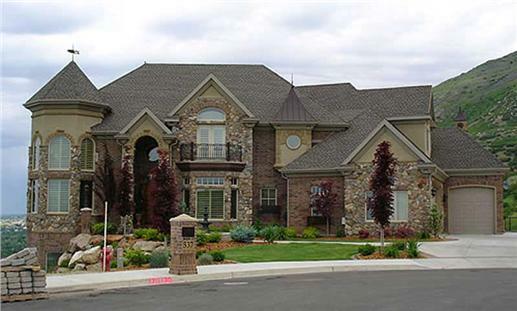 Again, exteriors are of brick, stucco or stone with minimal ornamentation. 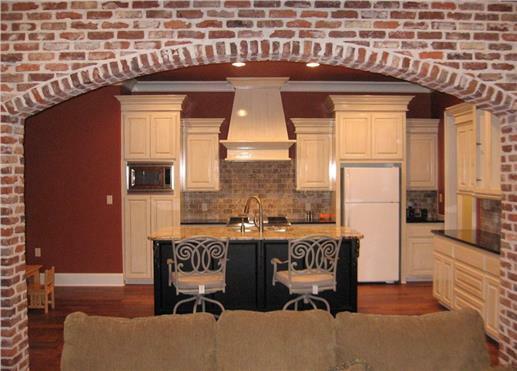 Windows can be arched or rectangular. 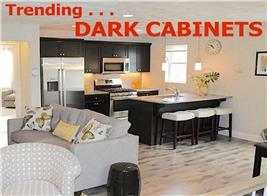 Floor plans can be open with a Great Room encompassing a formal dining room, a kitchen/kitchen island/breakfast nook. 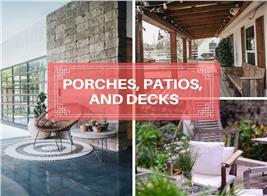 The space can also connect to an outdoor porch, a patio, or a garden. The flex space is perfect for formal and informal gatherings. These inviting double doors open into a beautifully simple five-bedroom home design (Plan #170-1573). It’s “symmetry in motion” with the balance of tall windows on each side. A hipped roof, brick façade and landscaping make it more attractive. 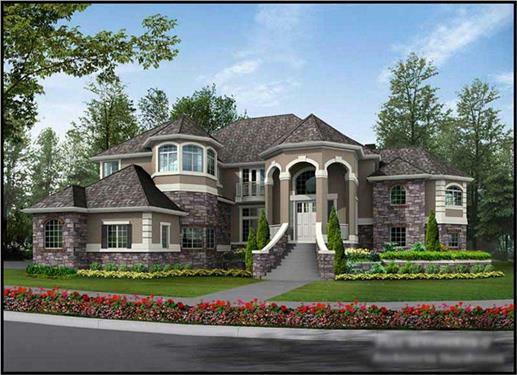 A French Traditional plan with five bedrooms that includes a Great Room, hearth room and study (Plan #170-2193). Open floor space with an informal sitting area, a work desk, kitchen/kitchen island and breakfast nook in French style home (Plan #115-1174). 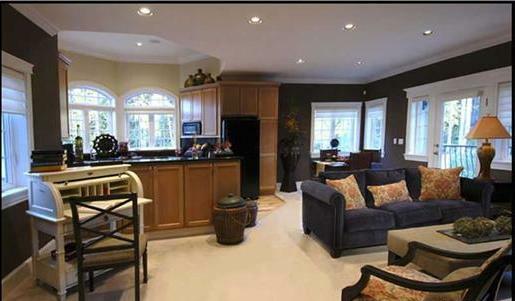 The kitchen area with a kitchen island and a view of the living room (Plan # 142-1045). 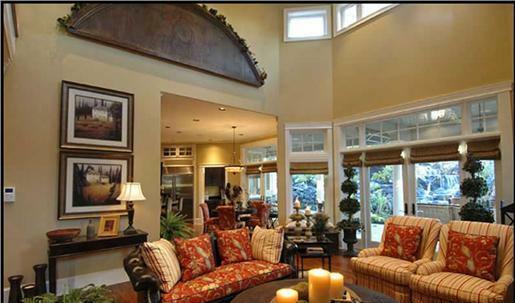 Another open floor plan (#161-1022) with the Great Room opening to an outdoor patio. 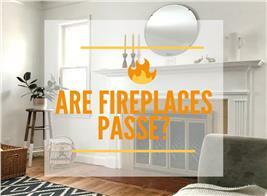 Which French Revival style do you fancy? If you want to recreate a more romantic age, you will find inspiration in a picturesque cottage on the hillside, an elegant manor, or perhaps, a chateau. After all, who wouldn’t love one of these charming homes?